Live Musicians will add a classy note and energy alongside your DJ. Whether it be for your on-site ceremony, cocktail hour, or reception Live Musicians can add a touch of elegance. They also add a high energy live feel during dance sets as they play along side your DJ. Some couples ask the question “What type of entertainment should we have for the wedding DJ or Band”? How about a combination of both. Add an elegant & sophisticated “LIVE” element to your ceremony incorporating musicians such as violinist, harpists, & pianist. Take it to the next level by adding a string trio or quartet for an unbelievable ceremony feel that will wow your guests. Give your cocktail hour a classy vibe incorporating live musicians. From a latin fusion jazz trio to a pianist playing tunes from Sinatra/Dean Martin to Billy Joel/Elton John. A strolling violinist or sax player, will impress & entertain your guests with these sophisticated options. When planning your event, the music you request will help make the right instrumentation suggestion. 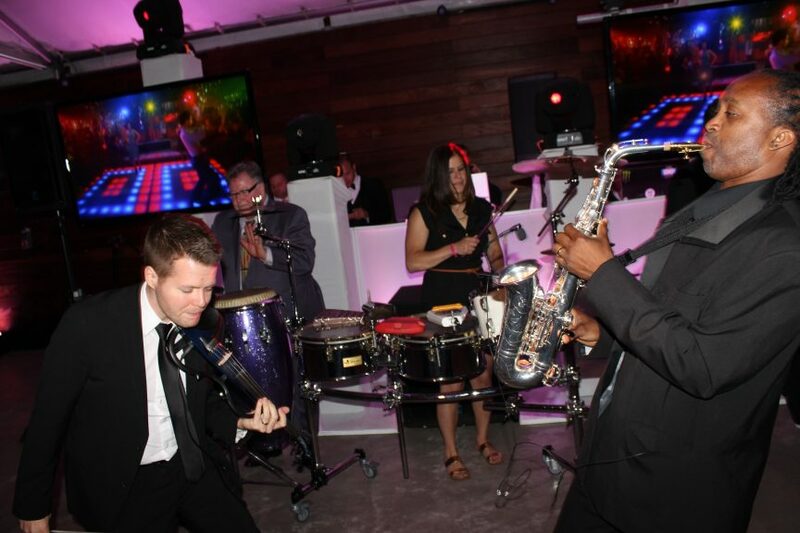 By incorporating a talented Percussionist, Saxophonist, and/or Violinist, you can spice up your event. Energize your dance floor with spectacular live sounds playing along your DJ’s tunes. Musicians mingling with you and your guests on the dance floor creates energy and great photo ops! Bring it to the next level with combo’s such as a Percussion/Saxophonist combo or Violinist/Percussion combo to give recorded tracks that live band feel to entertain your guests! In addition to Musicians, our talented Male & Female Vocalists can sing a variety of timeless classics. Entertain your guests during your pasta or main course. They can get right in the middle of the dance floor and sing along with today’s hottest DJ jams! These ideas really add a unique touch to your Wedding with class and style. By hiring professional entertainers, you can rest assured that all of these elements will blend perfectly. It is important however to make sure your DJ has experience with adding musicians and vocalists to his or her playlists. It takes that experience to pull it all together, when it is done correctly it is so impressive.